Altus (pronounced AL-tus) is a city and the county seat in Jackson County, Oklahoma, United States. The population was 19,813 at the 2010 census, a loss of 7.7 percent compared to 21,454 at the 2000 census. The town that would later be named Altus was founded in 1886. The community was originally called "Frazer", a settlement of about 50 people on Bitter Creek that served as a trading post on the Great Western Cattle Trail. Cowboys driving herds northward often stopped to buy buttermilk from John McClearan. Thus, the town was known locally as "Buttermilk Station". The Frazer post office opened February 18, 1886. A flash flood nearly destroyed Frazer on June 4, 1891. The residents moved to higher ground 2.5 miles (4.0 km) east of the original site. W. R. Baucum suggested renaming the town "Altus", a Latin word meaning "high". This name stuck, although the town was also known as "Leger" from July 10, 1901, to May 14, 1904. The city has seen relatively steady growth since the beginning. The population doubled between the time of Oklahoma statehood and the 1910 census and even increased during the Great Depression. 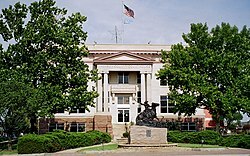 Although Altus had been designated as the Jackson county seat at the time of statehood, an election was held in 1908 to determine the permanent seat. The two towns contending were Altus and Olustee. Altus won by a vote of 2,077 to 1,365. The county courthouse was built there in 1910. An irrigation project in the 1940s and World War II led to further growth in the town as the nearby airfield was used to train military pilots. Altus was an important city on the defunct Wichita Falls and Northwestern Railway, one of the Frank Kell and Joseph A. Kemp properties, which stretched from Wichita Falls, Texas, to Forgan in Beaver County in far northwestern Oklahoma. It was later purchased by the Missouri–Kansas–Texas Railroad and since 1991 is operated by the Wichita, Tillman and Jackson Railway. In 1908, the Kansas City, Mexico and Orient Railway (acquired by the Atchison, Topeka and Santa Fe Railway in 1929) built a line through Altus. Around the same time, the Altus, Wichita Falls and Hollis Railway (which became the Wichita Falls and Northwestern Railway in 1911, then was acquired by the Missouri, Kansas and Texas Railway in 1922) constructed a line from Altus to the Oklahoma-Texas border. The railroads stimulated economic growth in the area and made Altus a regional agricultural center. By 1930, Altus had eight cotton gins, two cotton compresses, and eighteen wholesale businesses. Altus is located in northeastern Jackson County. It is situated in what used to be Old Greer County, an area with disputed ownership until a Supreme Court decision awarded it to Oklahoma Territory instead of Texas. The city lies between the main channel and North Fork of the Red River. According to the United States Census Bureau, the city of Altus has a total area of 18.6 square miles (48.1 km2), of which 18.4 square miles (47.6 km2) are land and 0.2 square miles (0.5 km2), or 1.08%, are water. Altus has a humid subtropical climate (Köppen Cfa) bordering upon a semi-arid climate (BSk). Summers are very hot to sweltering, though occasionally heavy rainfall does occur due to remains of Gulf of Mexico hurricanes moving inland. In the absence of these storms, Altus can be among the hottest places in North America: the record high of 120 °F or 48.9 °C recorded twice during 1936 has been exceeded by only Kansas and the western states of California, Arizona, New Mexico and Nevada. As of the census of 2010, there were 19,813 people residing in the city. The population density was 1,200 people per square mile (450/km²). There were 8,890 housing units at an average density of 540 per square mile (205/km²). The racial makeup of the city was 72.62% White, 10.41% African American, 1.48% Native American, 1.38% Asian, 0.20% Pacific Islander, 10.32% from other races, and 3.59% from two or more races. Hispanic or Latino of any race were 17.25% of the population. The public schools of Altus are in Oklahoma School District number 18. In the Altus Public School District there are nine schools, including five elementary schools, an intermediate school, a junior high school, a high school, and a learning center. For the 2011-2012 school year there were approximately 3,851 students. The school website is http://www.altusschools.k12.ok.us/district/. Western Oklahoma State College and Southwest Technology Center provide opportunities for higher education in the area.